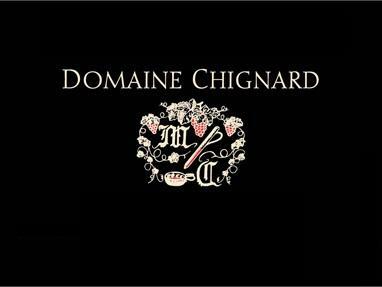 Even after many successful years practicing his craft, fourth-generation vigneron Michel Chignard claims to be a novice. He is a modest man, kind and courteous, but in every aspect of his winemaking one clearly sees a passionate perfectionist. In 2007 Michel turned the management of the family domaine over to his son Cédric, who is carrying on this philosophy with great pride and has already managed to prove himself in his first few vintages. The Chignard family is also blessed with vineyards in one of the best sites of the Fleurie appellation, Les Moriers, an arrowhead-shaped parcel that juts right down into Moulin-à-Vent vines. Their eight hectares of vineyards are over sixty years old, keeping yields naturally low. These old-vine root systems also run very deep, accessing minerals from the granite subsoil and giving Chignard's Fleurie a trademark goût de terroir and great freshness. While many critics attribute Michel's success to the soil, Kermit would argue that his traditionalist stance on vineyard management and winemaking is essential to craft such great wines. As ardent defenders of traditional Beaujolais methods, the Chignards take a minimalist approach in both the vineyards and the cellar. The finished wines couldn't be more reflective of Les Moriers' splendid location: light and playful, with deep, ripe fruit and finesse. The Chignards have recently started making wine from another Beaujolais cru, Juliénas, which produces a beautiful, high-toned wine in keeping with the style of the domaine. La Revue du Vin claims that the aromas from their wines evoke memories of the great Chambolle-Musignys from Burgundy, to the North...but who's to say, maybe they got it reversed. James Suckling 92-93"Plenty of fruit and stone character with wonderful minerality yet round tannins and ripe fruit. Already very balanced. Richness and freshness in check."~J.S. James Suckling 95“Aromas of black cherries and blueberries in addition to violets and granite. This is very structured with tension and polished tannins. Wonderful length and finesse. Try in 2020.”~J.S.